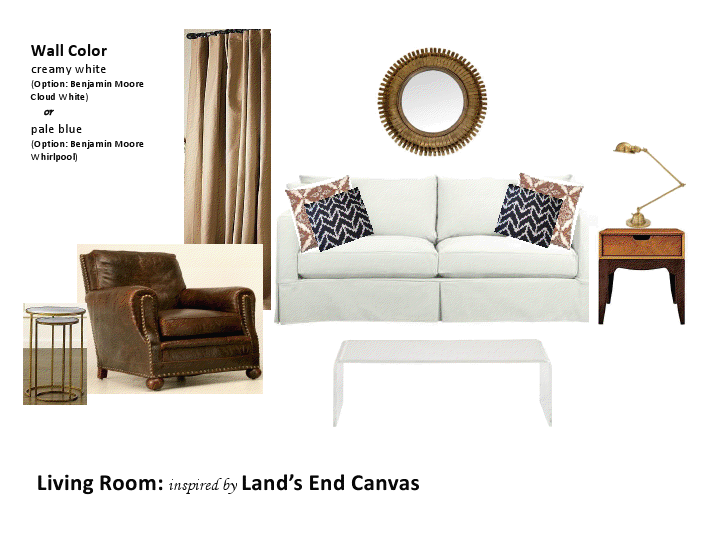 My incredibly fashionable friend Jenny is taking the wheel today with some ideas for living room design! Lady, you can redecorate my house anytime you want! You can find Jenny on Twitter @tipyourwaitress. By now if you haven’t heard about Land’s End new line, Canvas, you’ve been living under a rock. I mean, let’s just be honest here. There is a strong connection between style in the closet and style in the home. And I love both. If you’re like me, though, it is a little harder to find perfect things to dress myself than perfect things to dress my nest. And I tend to quite irritated after a day of shopping for clothes with no bags to show for it, but I assure you I can always find something for my home. So let’s see just how connected personal and home style can be! This particular outfit is one of my favorites from Canvas. It’s a perfect ensemble to inspire the design of a casual, but traditional living area with a touch of modern. Artwork is personal, but I think a few vintage or antique equestrian prints would look fantastic in this space. And for those of you who are a little more brave with pattern, that navy chevron fabric would make some incredible window treatments! I’d opt for the creamy white walls with that option. Now just grab your coffee, your favorite design mag and enjoy a perfect morning in your new living room! Oh, and maybe sneak in a little cyber shopping while you’re at it. love love LOVE it! and i would boldly put that chevron on my window treatment for SUREZ! great job jenny! i love the outfit and the room!